"Put your faith in what you most believe in / Two worlds, one family / Trust your heart / Let fate decide / To guide these lives we see," begins Tarzan The Stage Musical at Meralco Theater. Those who watched the 1999 Disney movie Tarzan will find themselves singing along to familiar tunes like the lines above from the song "Two Worlds" as well as other compositions such as "You'll Be in My Heart," "Strangers Like Me," "Who Better Than Me," "No Other Way," "I Need to Know," "Different" and more. 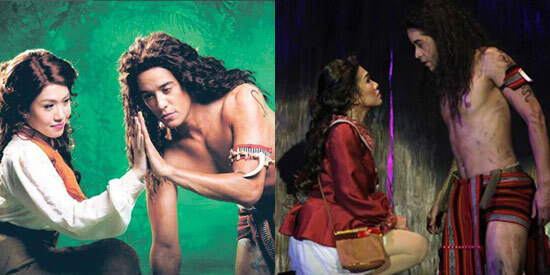 The local stage adaptation features Broadway actor Dan Domenech as Tarzan, singer-actress Rachelle Ann Go as Jane, former balladeer Calvin Millado as the alpha ape Kerchak, singer-actress Ima Castro as Tarzan's adoptive ape mother Kala and singer-actor Jeffrey Hidalgo as Tarzan's best buddy Terk. Tarzan The Stage Musical is directed by Chari Arespacochaga under Viva Atlantis. It is based on the Disney film and adapted from the story Tarzan of the Apes by Edgar Rice Burroughs. Ima Castro gives a very realistic portrayal of a mother ape as she played Kala, Tarzan's adoptive mother. From her movements to her gestures to the way she would slump her body and enter and exit the stage, Ima delivered a top-notch Kala performance. She is vulnerable and strong at the same time when she sings "You'll Be in My Heart" at the start when her tribe leader and husband Kerchak refuses to accept the infant Tarzan into their tribe. He eventually does accept Tarzan but continues to be wary. Years later, Tarzan is exiled by Kerchak for constructing what Tarzan calls a fruit picker but what Kerchak perceives to be the start of Tarzan building tools that can harm the tribe. Kala does her best to reassure the despairing Tarzan. She comforts him by saying that even though they look different, underneath all the difference, they are just the same. Kala refuses to give up hope and pleads with her husband Kerchak again to accept them. Many years later, after Tarzan and Kala have learned to live apart from the tribe, Kala once again has a highlight moment with Kerchak. The estranged pair sing "Sure As Sun Turns To Moon" and you can feel the pain and the longing of Kala and Kerchak for each other. Yet underneath, they still hold on to their stubbornness as Kala struggles to make Kerchak finally accept Tarzan: a stronger, more mature version of himself...but sadly still a man-ape, not an ape as Kerchak wanted. Seeing Kerchak, portrayed here by Calvin Millado, struggle throughout the play between his obligation to his tribe as a leader and his desire for wife Kala is touching and very real. Calvin's gruff voice and big moves help him portray a larger-than-life Kerchak and add to the ape's imposing presence. His delivery of "No Other Way" reveals so much of the internal struggle he is going through and when he resolutely makes a decision, you can feel that he doesn't do it lightly or frivolously. The inclusion of a Broadway actor who bears Glee, Rock of Ages, Fame, Semi-Pro and Viva Laughlin credits to his name ensures a certain quality and finesse, and Dan Domenech doesn't disappoint. He swings in ever so gracefully on his guided rope, toes pointed ever so elegantly and sings with such power and maturity in his voice that you'll find yourself wishing more than once you were Jane. One of the highlights of the Tarzan movie involved showing a moving visual montage featuring slides from the "modern" world. The stage version offered a semi-visual montage that was elevated simply because of the power of Dan's voice and the emotion he let through with a simple slight of the head or a shrug of the shoulders. "Strangers Like Me" was one of the most anticipated scenes in the movie and in the theatrical version as well. Dan's Tarzan sings this song beautifully along with Rachelle Ann's Jane. This duet is a crucial climax point driving the story forward as Tarzan begins to embrace the reality that he could possibly belong to Jane's world as well. What provided an added kick to Tarzan The Stage Musical—aside from the more than excellent delivery of the beloved songs by most of the cast—is the colorful and brilliantly-lit stage and decor. The use of shadows on color and light adjustments as well as well-crafted stage props allowed for a more or less fluid transition between each "set:" moving from jungle to outpost, past to present with ease and harmony. The leopard character is particularly graceful as the person leaps and bounds across the stage during the fight scene with Tarzan. It retains the use of British accents for cast members (with Rachelle Anne giving a super cheery and upbeat version of Jane). Another interesting flavor that viewers in the Philippines can appreciate is Tarzan's use of an Igorot bahag instead of a loincloth used in the Disney movie. Most of the ape's costumes also look like they were sourced from indigenous materials. It helps that the styling of the bahag perfectly shows off Dan's or rather, Tarzan's fabulous abs. Despite the prodigious ab exposure of Tarzan, the musical is definitely more than kid-friendly and during the night we watched, kids in the audience would react every so often when a familiar tune was performed or during the climatic scenes they recognized from the movie. The play's weakness would have to be the young actors tapped during the first part of the musical. It didn't help that crackling sounds could be heard while the young performers were singing. Still, Tarzan the Stage Musical proved to be an entertaining way for families to bond over a classic children's story.